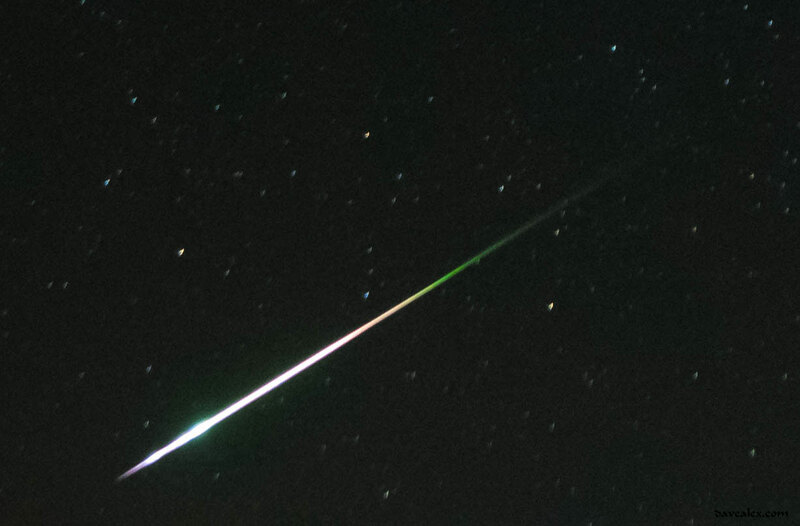 This year has been a lot of fun watching meteorite showers, and Perseids 2016 did not disappoint. I was able to watch the skies a week prior to the peak on the east side of the Collegiate Peaks near Buena Vista, then again the night before, during and after the peak of the Perseids (peaked Aug 11, 2016). 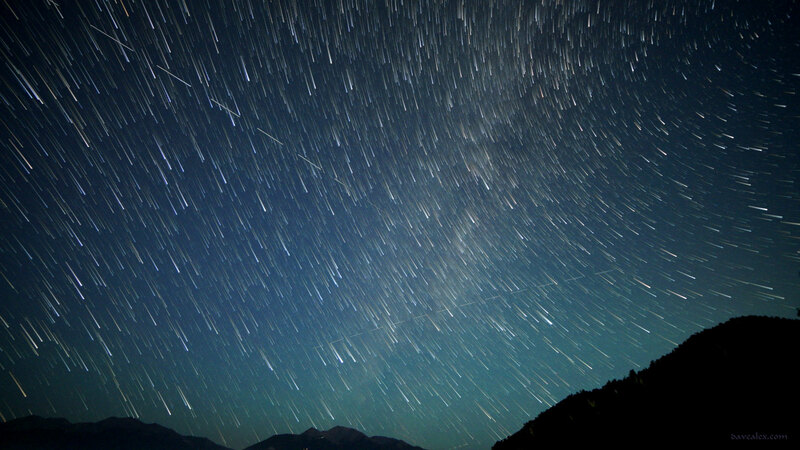 The Perseids are created by the dust trail from comet Swift Tuttle as our orbit intersects with its debris each year. This year was a special “outburst” year thanks to our cosmic friend Jupiter whose gravity altered the course of some debris last year; making way for a more dusty intercept on this year’s orbit for Earth! In Colorado about a week before the peak, the days were socked in with clouds and some rain, but after midnight the clouds cleared out and provided a wonderful display of the stars and Milky Way over the Collegiate Peaks from the Arkansas Headwaters Recreation Area south of Buena Vista Colorado. Although I didn’t capture it as it was left of my field of view, I saw a massive fireball which I can only assume was a Perseids meteorite! Several other meteorites I witnessed that night were likely Perseids. 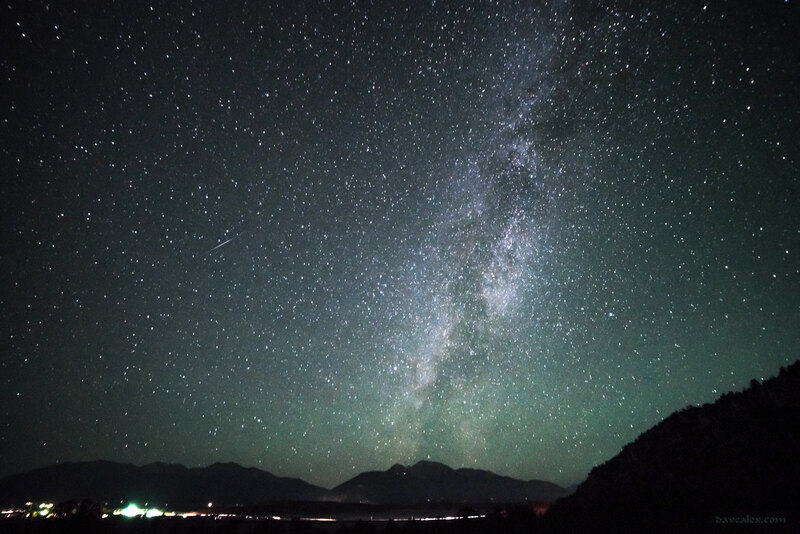 Milky Way over Mt Princeton, with Mt Antero on the left. 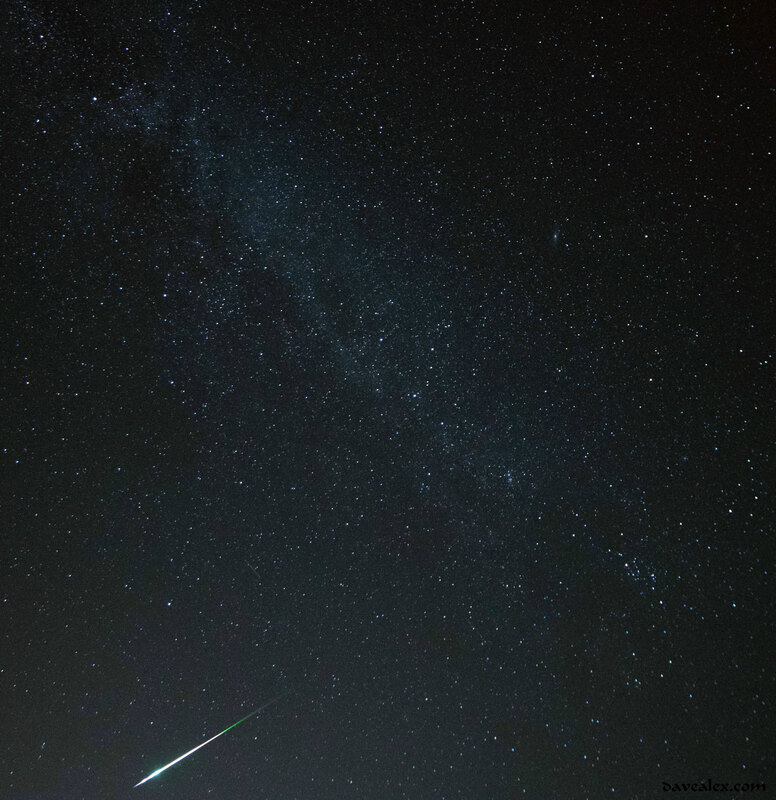 A small meteorite also captured! I took this picture with Sony Alpha A7RII with Rokinon 14mm f2.8 prime lens. 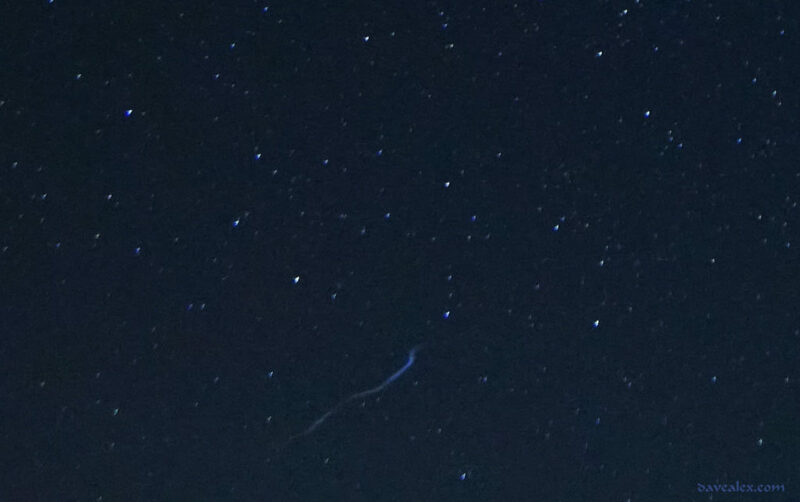 Manual focus was set to infinity, f2.8 and exposure was 8 seconds at ISO 12800, obviously on a tripod. I have found that opening the exposure over 8 seconds leaves a blur/trail with stars that I do not like, so I had to adjust the ISO to absorb more light. 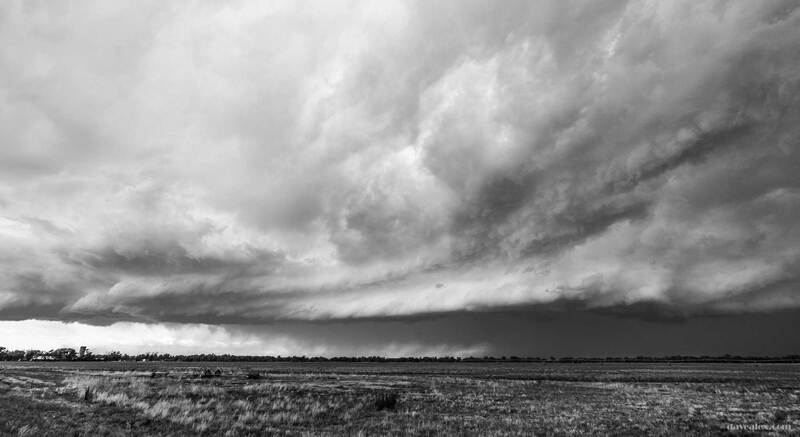 I made some minor adjustments in Lightroom. 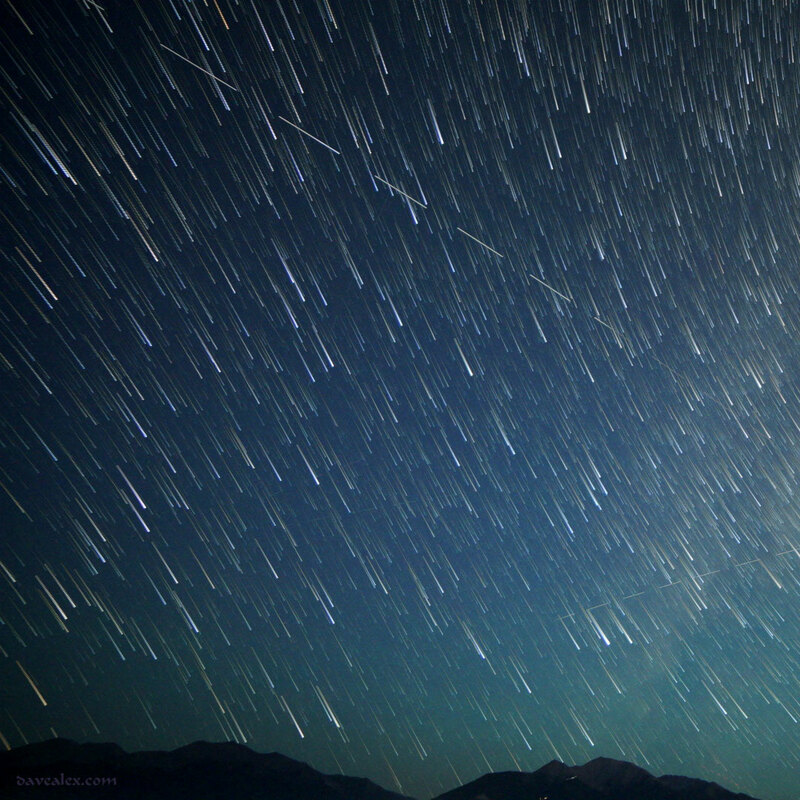 Star trails from several stills over Mt Princeton. I thought this was a fun shot, it was a video capture of the stars including Milky Way using the A7RII Star Trails app. This is a fun little app but I have not explored it deeply yet to discover if there are many creative uses for it other than the obvious. A couple of satellites are also present streaking across the sky over each 8 second exposure. 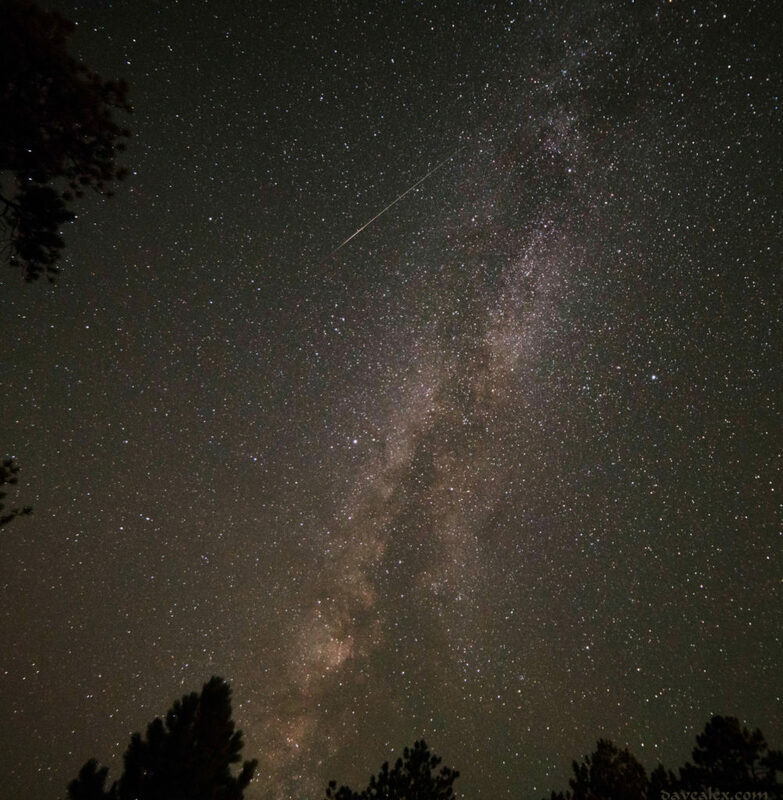 Fast forward a little under a week, to the days around the peak of Perseids 2016. 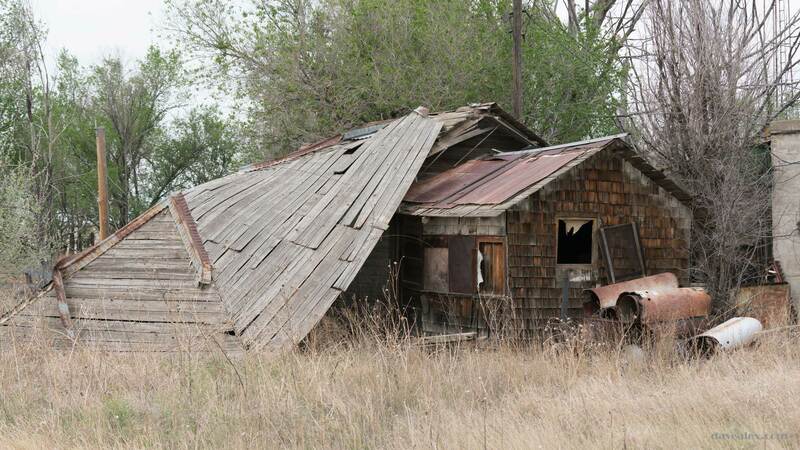 Each of the nights here where I live near Larkspur Colorado it was cloudy and stormy before and after dusk. But luckily each night all the storms moved off east and the skies cleared up in time for the moon to set and give great dark skies for viewing this “outburst” year. I set up in my front yard pointing towards the south/western sky which is the largest portal I have through my trees. I was able to witness many Perseids shooters and caught a couple in my field of view. Amazing color on this closeup of a Perseids fireball caught on the eve of the peak. 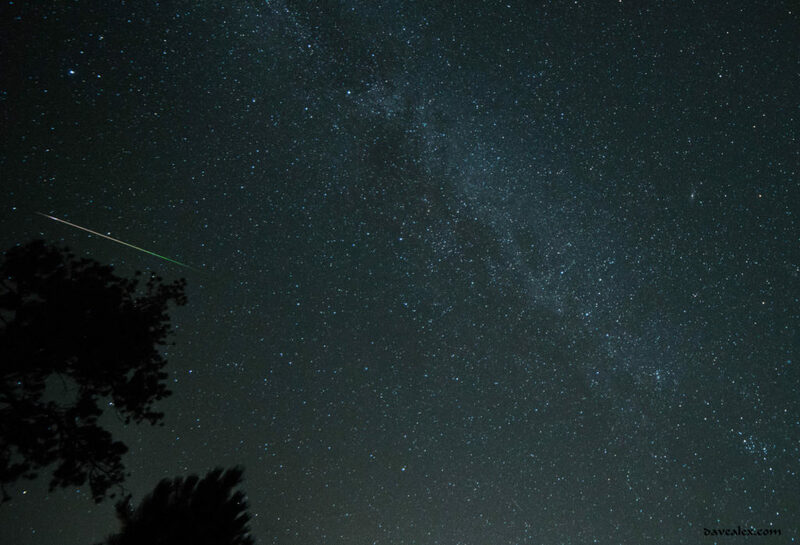 I caught another amazing meteorite and did a digital crop to show the spectacular colors of Perseids meteorites! This was the largest shooter I saw the eve prior to the peak. Then came the peak, which again was forecast to be up to double of other years! I set my alarm each hour after dark and went outside to witness the show, but it was very cloudy and even had a thunderstorm to our south. I was getting bummed as by 12:30 we were still socked in with clouds! At the 1:20 alarm, however, the sky was crystal clear; amazing what can happen in less than an hour here in the Colorado foothills! The sky stayed clear until dawn, when it got cloudy again. Perfect timing, mother nature! First 30 minutes, 54 shooters, 13 were large and several fireballs. Finally cleared up after a cloudy evening. Last 30 minutes. 231. 87. Given that I live in a forest and have a limited window into the night’s sky, I think this is an amazing number, one of the best I’ve seen in the many many showers I’ve watched! I caught about 50 of these on my camera, which is definitely the most I’ve ever caught, but due to the wide angle (14mm, Rokinon f2.8 prime lens) most were really small and overall uninteresting. 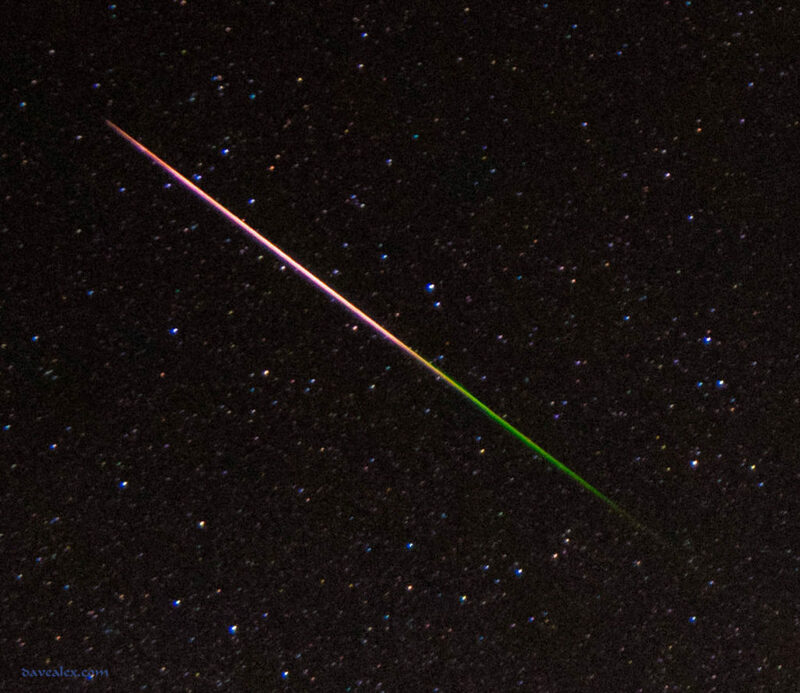 I did catch some spectacular fireballs in the field of view; but missed most which is par for the course. 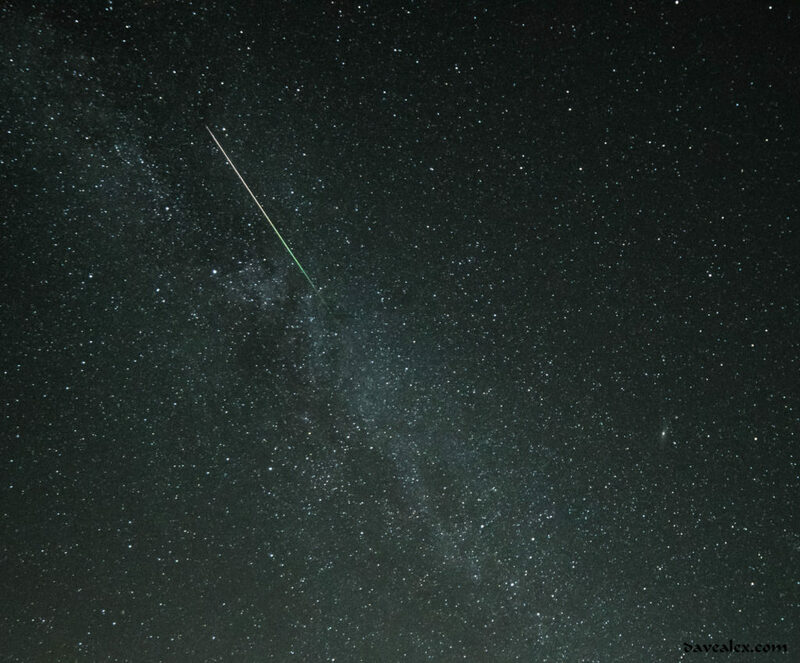 Perseids shooter, very large (fireball) showing the Milky Way and wonderful colors as it burned up in our atmosphere! This was the morning of the peak of Perseids 2016, this large fireball left a vapor trail for many minutes. Extremely lucky that it stopped at the bottom of my field of view! I was surprised that I actually caught this one! Closeup of a Perseids Fireball! Vapor trail immediately after the prior fireball, this lasted several minutes and was distorted as the upper atmosphere winds moved it irregularly. The night after the peak I was exhausted, so I missed setting the alarm reminding me to get up in the early morning hours. I did go out about 4:30 and saw a burst of about 15 in 15 minutes, 2 of which were “large” on my subjective scale…which surprised me on the morning after the peak! My cell phone app states that the shower’s window is July 17th through August 24th, so there are surely many more nights to experience this year!